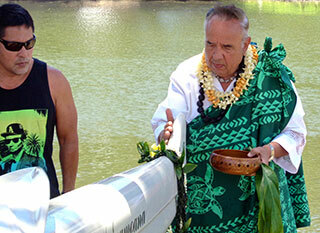 Kahu Silva blesses canoe for Hui Lokahi canoe club. 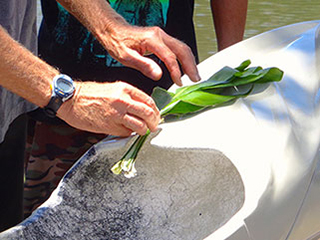 A rarely seen traditional Hawaiian canoe ho`ola`a (consecration) ceremony called Lolo `ana i ka wa`a (imparting brains to the canoe) was performed by Kahu Silva for the launching of Hui Lōkahi’s new racing canoe named “Ka`aumoana.” The event was held on May 3, 2015 near the Ala Wai canal on the island of O`ahu where the canoe was about to be launched. Prior to the dedication, members and friends of the Hui Lōkahi canoe club festively adorned and decorated the new canoe with lau ki (ti leaves), leis, vines and other forest greenery. In accordance with Hawaiian spiritual protocol, at high noon, when the sun reached its apex, the solemn rites commenced. 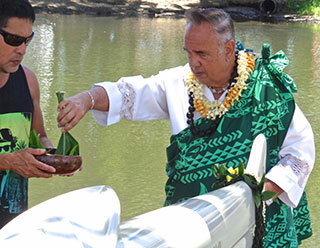 Using a calabash filled with seawater, Kahu Silva began the ceremonial blessing of the canoe with a sacred pi kai (sea water purification) ritual and accompanying prayers beseeching Hawaii’s benevolent deities to instruct, guide, protect and ensure the success of the canoe and the safety of its seafaring occupants. Kahu concluded his services with the offering of an ancient Hawaiian mariner’s prayer oli (chant) that was used for the launching of the Hokule’a, at Kualoa, O’ahu in 1975. 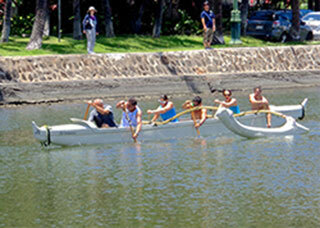 Following the ho`ola`a, the canoe was launched and returned to shore thus proving its seaworthiness. Assisting Kahu with the blessing is Mark Inouye, President of the Hui Lōkahi. I have just purchased an OC1 and would love to have a proper boat blessing. Do you know of a Kahu on the East Coast (I am in NYC area) that I could contact. I will also be competing at the Liberty Challenge if a Kahu will attend that race.